This event is a Touring Assembly and as such is untimed. Navigation is easy and the event suits newcomers to road events. Starts and finishes at Blackburn Northern Sports, Pleckgate Drive Blackburn and runs out to Heskin Hall via Croston, Rufford and Martin Mere. The return journey takes in Anglezarke, Haslingden Grane and Pendle Hill. Some great scenery and even greater roads to enjoy. Entry fee includes Light breakfast available at Start and Light Refreshments in the Club Lounge where the Bar will be open on return. Route is some 80 miles with instructions using both simple ‘tulip diagrams’ and written instructions. All entrants receive a Route Book giving full directions along with a Rally plate. 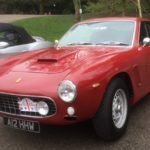 The Federation of British Historic Vehicles Club urges all owners of licensed historic vehicles to use them St George’s Day in April – every year. The ‘Drive it Day‘ will be a truly national annual event and one that all enthusiasts can take part in wherever they live. It’s not necessary for owners to go to a show or to take part in an event, FBHVC just wants owners to get their vehicles out so they can be seen by the public. If the vehicle is suitable, it could be used instead of modern transport for daily activity. Owners could use them to go to work take a trip to the seaside, enjoy a day out in the country, visit a stately home or just go shopping.